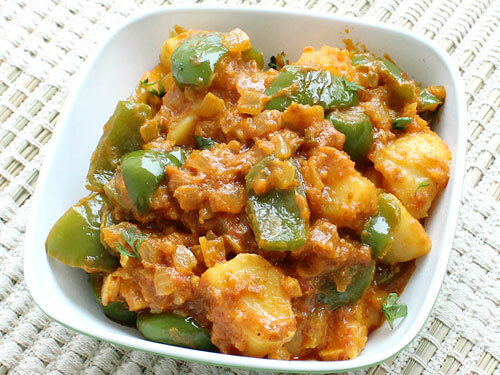 Capsicum Potato Curry: Capsicum potato curry is a dry vegetable North Indian curry that has no liquids. Capsicum potato curry is not just easy to prepare but very palatable too. Potato and capsicum are two main ingredients of Indian cooking and make many delicious dishes and curries. Capsicum potato curry is usually served with tandoori roti, chapati, butter naan or steamed rice for lunch or dinner. Rinse capsicum and potatoes under running water. Dice or chop the capsicum. Peel and dice or slice the potatoes into small pieces or slice them a little thin, as then they are easier and faster to cook. Heat the oil in a wok or kadai, on medium heat. Sauté the potatoes in the oil, till they are half cooked and start looking crisp from the edges. Sauté for few minutes, on low flame. Add in turmeric powder and red chilli powder. Cook on low flame without any lid, for 2-3 minutes. Cover the wok with a lid, and mix every few minutes. After the vegetables are cooked, add in the garam masala and dry mango powder. Capsicum potato curry is ready to be served. Serve capsicum potato curry with hot with phulkas or rotis. If you have any queries regarding the Capsicum Potato Curry recipe, please leave a comment.